When we first launched FreeAgent, it ran on Ruby 1.8.6 MRI (and Rails 1.2!). We graduated to 1.8.7 REE when that became popular, then in the summer of 2011 we upgraded to Ruby 1.9.3. We’ve been running on that version (1.9.3-p194 to be specific) ever since. It has served us well, but performance is not one of Ruby 1.9.3’s strong points and we’ve seen our application server response time gradually grow over the years to the point where we really wanted to do something about it. Just over a year ago, Ruby 2.0 was released. This introduced DTrace support and GC optimisations, both of which were of particular interest to us at FreeAgent since they allow us better insight into what Ruby is spending its time doing. As an added bonus, we also expected an improvement in performance. Late last year we spiked up a branch of FreeAgent that ran on Ruby 2.0 but before we’d even started to QA this, Ruby 2.1 was released on Christmas Day! Over the past couple of months we’ve been keeping our Ruby 2.1 branch up to date with master and, after a rather epic QA process, we finally merged those changes into master earlier this week. For the time being we kept running on Ruby 1.9.3 but yesterday we made the flip and FreeAgent is now running on Ruby 2.1.2 across the board. In this article I’ll share the insight we’ve gained in terms of performance, and as there always seems to be with Rails and Ruby upgrades, we came across an awkward gotcha that we can hopefully help you avoid when you upgrade. 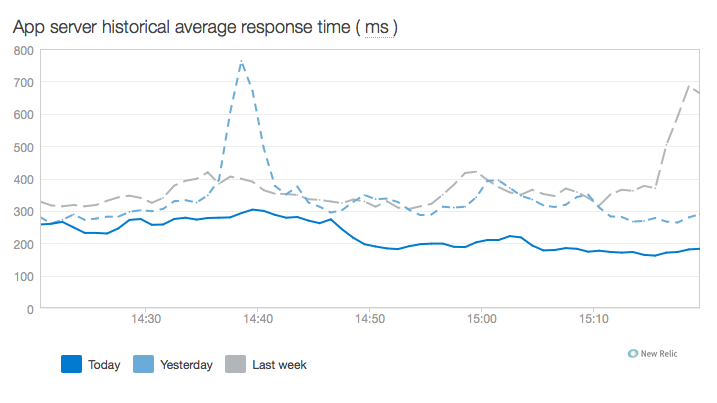 Here’s a picture of how FreeAgent behaves on our application servers during a typical afternoon with a throughput of ~2000 requests/min. As you can see, DB latency is encouragingly low, whilst Ruby is responsible for around 80% of the server-side processing time ringing the average over 300ms – much too high for our liking. In order to roll out the Ruby 2.1.2 upgrade, we did what we call a canary deployment. This is where we deploy a particular branch to a quarter of our application servers (one out of four, as it is today) so we can monitor its behaviour while reducing the risk of introducing any customer-facing side effects. 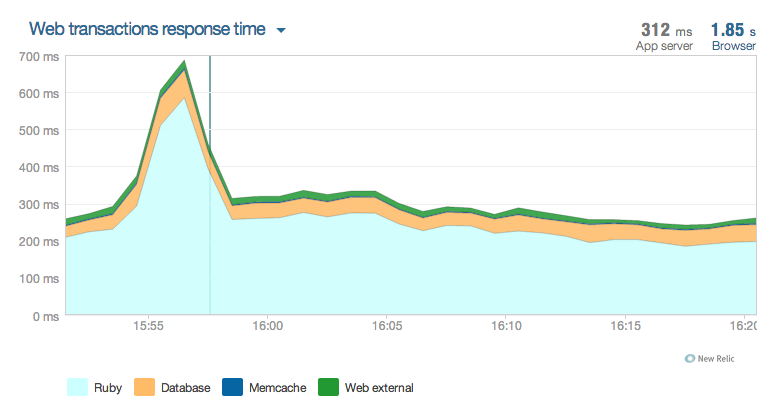 The following graph shows the server-side response time after we did this deploy (indicated by the blue line at 15:57 – complete with odd New Relic response spike, something we’ll save for a future post). Even though Ruby 2.1 is only running on a ¼ of the stack, you can see a visible decline in response time almost immediately. This was encouraging! 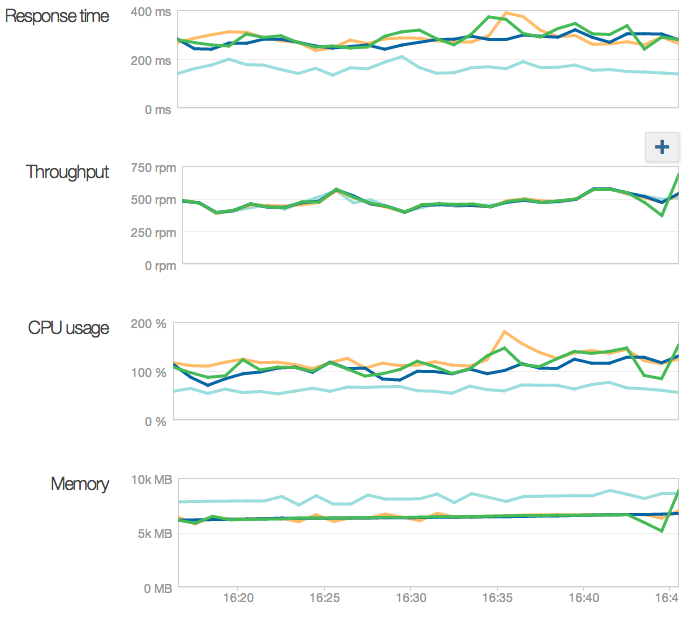 Although we expected it, the memory growth was a bit of a concern. 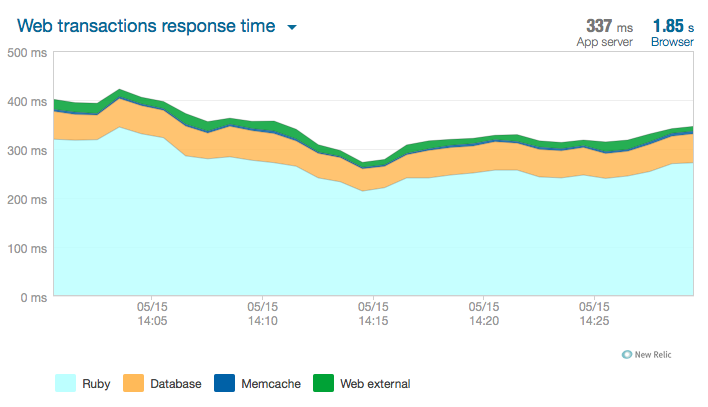 While we have a fair amount of headroom on our app servers, we wanted to make sure this didn’t get out of hand. One of the contributing reasons for our decreased response time running Ruby 2.1.2 is the improved garbage collection algorithm. Ruby now uses a generational GC algorithm, which allows Ruby to perform quick minor GCs to catch short lived objects, preventing the need to run a full, CPU intensive GC as often. The problem with this is a web request often involves lots of “medium” lifetime objects that are only around for one or two minor GC’s. The current algorithm considers an object old if it has survived one GC. This causes the memory to bloat with old objects that are no longer needed. The old memory continues to bloat by default until it doubles in size, only then a major GC triggered. The solution? Trigger a major GC sooner to avoid old objects no longer needed wasting space. We can do this by tweaking the environment variable RUBY_GC_HEAP_OLDOBJECT_LIMIT_FACTOR. After tweaking this from the default value of 2 to 1.3 memory usage was constrained and settled back down to an acceptable level. At this stage we were pretty happy, but we wanted to run on the canary server overnight just to make sure no issues came about. When jobs created under Ruby 2.1.2 were processed by a server running Ruby 1.9.3, we found that the time was deserialised as a Time object instead of the String we expected. We quickly patched the symptom but it took longer to work out why this was happening. There are a few moving parts involved. Ruby 2.1.2 includes version 2.0.5 of the YAML parser Psych, while Ruby 1.9.3 includes version 1.3.2 of Psych. When serialising a set of objects to YAML, Psych visits each object and internally creates a tree of strings. This tree of strings is then converted to YAML tokens using the class Psych::ScalarScanner that internally uses regular expressions to identify YAML types. The regular expression used to identity time objects changed in the new version of Psych, which meant our nanosecond precision time was now correctly converted to a YAML Time type rather than being left as a string. When the YAML time type is deserialised in Ruby 1.9.3, it’s converted to a Ruby Time object. The same would happen in Psych 2.0.5 if it were not for a new feature called Safe Load which was introduced after the recent Rails YAML deserialisation security vulnerabilities. In Psych 2.0.5, times are not a “safe” type and so our YAML Time type is returned as a String. I’m calling that a big win.